European style leather bar stools that swivel. Classic and contemporary styles. Handcrafted swivel barstool. Birch frame. Top-grain leather upholstery. Nailhead trim. Bar stool accented with an antique brass metal footrest on front stretcher. Features body with swivel mechanism. Fixed linen upholstered seat and inside back. Plantation grown mahogany hardwood and cane matting. Handcrafted swivel counter stool. Birch frame. Top-grain leather upholstery. Nailhead trim. Finished in glacier with a graphite bonded leather cushion, this stool features a memory foam cushion to alleviate pressure points and help you sit comfortably for as long as you wish! It also features a full-bearing 360° swivel. Beautifully upholstered in Italian leather or our soft everydaysuede™, the Manchester brings distinguished style and supreme comfort to the bar. The deep seat cushion and gently pitched back are trimmed in antique-bronze nailheads, and the solid wood is finished by hand in a dark espresso. Handcrafted barstool. Maple frame. Bonded-leather upholstery. Swivels 360 degrees. Bar stool with bonded leather cushion. Built using mortise and tenon construction for ultimate durability. Features a full ball-bearing 360° swivel. Individual tacking. Birch frame. This rustic counter stool focuses on the details with a fabulous mixture of textures combining an anthracite black finish with distressing and brown rub through, with bronze nail head trims accenting the seat and back. A vintage style brown leather seat, a complementing light brown fabric back with detailed scrolled motifs on the frame and metal kick plate on the footrest. A classic woven bar stool gets a chic update when it features winter white bonded leather and stainless steel with a polished nickel finish. Handcrafted leather barstool. Brass frame. Handcrafted barstool sold individually; two shown for detail. Alder wood frame with dark-walnut finish. Polyester velvet upholstery with glass-button tufting. Peacock scarf upholstered onto back of stool combines sheer and velvet fabrics finished with beading. Handcrafted barstool. Alder wood frame with dark-walnut finish. Polyester/rayon velvet upholstery. Handcrafted barstool sold individually; two shown for detail. Alder wood frame with dark-walnut finish. Polyester/rayon velvet upholstery on inside; polyester rosettes on outside back and arms. Handcrafted barstool. Wood frame. Tufted polyester/linen upholstery. Padded arms. Handcrafted Alain counter stool with diamond tufting. 19"W x 24"D x 40"T. Cotton and rayon shantung upholstery. Foam padding. Solid pine frame. Create a welcoming gathering spot and inspire guests to linger. Designed with deep button tufting and a barrel-curved back, this barstool offers unparalleled comfort and style. Create a welcoming gathering spot and inspire guests to linger. Designed with deep button tufting and a barrel-curved back, this barstool offers unparalleled comfort and style. Available in two heights to suit your needs, this stool is a bit more formal than you might expect. The "draping" of the seat is highlighted by both burnished gold trim and nailheads for added emphasis The design of a vintage draftsman’s stool is captured in this barstool. It features a curved footrest, rolled feet and a comfortable leather seat. Acrylic counter stool with brass accents. Faux-shagreen cushion. A deeply cushioned saddle seat makes this barstool a comfortable spot to linger. Antique-bronze nailheads outline the seat, and a bronzed metal plate protects the footrest from wear. Counter stool and barstool sold separately. Iron frame; mango wood seat and base. Swivels. This barstool is a chic update to industrial style with a richly distressed base and a hardwood seat that’s scooped for comfort and finished by hand for lasting beauty. Pearl-white, faux-shagreen counter stool. 19.5"W x 21.5"D x 40"T with 28"T seat. Welded-iron base with brass finish. Handcrafted leather barstool. Brass frame. Handcrafted Reese bar stool in clear. 16"Sq. x 34"T; seat, 30.5"T; foot rest, 10.5" from ground. Clear acrylic seat. Aged-goldtone metal base. The lofty legs, stretchers, and exposed wood along the back rail of this bar stool are finished by hand to bring out the grain of the wood. The neatly tailored seat and arms are finished with self welting; the stretcher food rest is accented and protected with a brass wrap. Stool with exposed wood along back side of stool in black finish. Peruvian oak and Chilean pine frame. Linen/rayon upholstery. Handcrafted bar and counter stools with brass nail head trim. Hardwood frame. Upholstery: polyester. Handcrafted barstool. Acrylic. Bar stool accented with an antique brass metal footrest on front stretcher. Features body with swivel mechanism. Fixed linen upholstered seat and inside back. Plantation grown mahogany hardwood and cane matting. Zaria pub table in brown/gold. 40"Dia. x 42.5"T. Crafted of white oak veneers, rubberwood solids, and brass-finished metal. Originally based on the Windsor design, the ladder-back barstool has become an American icon. Café seating is always in style. Bent-wood stretchers and faux leather on the backrest and seat add warmth and character to this stool. The antique-brass nailhead trim on the backrest is set along a gimp for that little extra touch of quality. Skilled artisans craft the Aaron Barstool from solid wood, carefully hand joining the X-shaped back for precise symmetry. Contoured seats and a curved back offer subtle flared detail. Upholstered barstool sold individually. Peruvian oak and Chilean pine frame. Linen/cotton upholstery with European burlap trim. Small-space dining can still look good. 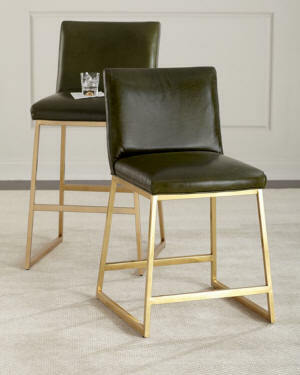 The Cline Counter Stool is modeled after a vintage style, with simple curved details along the back. The rich Charcoal finish adds bold contrast to a room. Charcoal Anegre comes to life in this oval bar, fittingly titled, Mix-ology. Its striking blue sandstone top, with brown and grey veins, is trimmed with crisscrossing metal handles in Whisper of Gold that rise above its surface. Finished all around the piece, the elegantly curved doors open with custom metal pulls to reveal generous storage for hanging wine glasses, bottles of wine and other bar essentials. This silhouette rests on modern triangular legs fitted in custom metal ferrules. 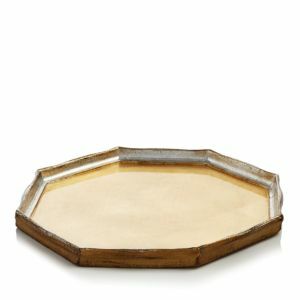 Mix this mid-Century modern piece into classic or modern settings. Consider this our most luxe-to-date take on a tamboured midcentury silhouette- crafted of rosewood, topped with marble, and finished with accents of polished brass Carved completely by hand, this gorgeous piece is profoundly versatile: It makes an ideal bar cabinet, but also provides statement-making storage in any other room of your home. We're particularly taken with its exaggerated, geometric hardware, crafted from brass and embellished with pink or white agate for a glamorous finish. Handcrafted bar cabinet. Pine wood/wood composite on a metal base. Two doors conceal two drawers, one pull out shelf, and one fixed shelf. One exterior fixed shelf on base. Handcrafted bar cabinet. Ash solids and quartered white oak veneers Case and doors wrapped in Vienna walnut bonded leather with contrasting stitching. Behind doors is one adjustable/removable tempered glass shelf, one open compartment, two drawers with wrapped pad and six stemware holders, which will accommodate up to 18 stems. "X" shaped wood base with stainless steel metal collars and center stretcher in burnished brass finish. Handcrafted bar cabinet with radial pattern. Two wood and three glass shelves, all removable and adjustable. Antiqued brass detailing. Cerused oak. Elegant bar carts are the perfect solution for small spaces or additional service space for large gatherings. Many are available in additional finishes. The perfect bar for the modern home, Drinks Are On Me adds a touch of luxe to entertaining. Its straightforward profile is complemented by a Whisper of Gold finish and three clear, tempered glass shelves. A center storage drawer with laminate top for serving completes the look of this multifunctional beauty. Multitiered, this antiqued brass bar cart offers extensive opportunities for styling. Perfect for parties, the black glass tray top is removable, taking martinis on the go Handcrafted bar cart. Tubular steel frame with champagne finish. Three glass shelves. Bottle storage on both ends of bottom shelf. Casters. Go old-school glam with a bar cart that can easily move from cocktail hour in the entryway to a nightcap in the living room. The Skylar Bar Cart’s mirrored bottom shelf adds dimension while displaying your spirits in style. Handcrafted geometric hourglass martini table. Finished in antiqued mirror. Wood composite and glass. Handcrafted twisted branch martini table. Polished cast aluminum base. Marble top. Handcrafted martini table. Polished brass base. Natural sliced and polished agate top. Handcrafted column side table. Solid, lead-free crystal top and brass base. Function and style: this martini end table provides a useful table surface where needed. The column's four sides are overlaid with an X and diamond motif; the top surface under a round of thick glass is veneered in figurative walnut burl. Handcrafted side table of solid acrylic. Open, oval center. Handcrafted side table. Stainless steel base. Laminated marble. The sweeping curved pedestal base with carved details supports a hand-painted faux azurite top. The pedestal is finished in deep clue and case aluminum tassels hang from each corner, finished in New World gold to match details on the base. The round glass inset of this side table is accented with belt leather and industrial flathead screws. The robust square tapered legs, held together with metal stretchers, are finished in warm hand rubbed Rye. Handcrafted martini table with acrylic side. Wood composite, smoked eucalyptus veneer. Stainless steel trim. Modern materials meet geometric edge for quick sophistication. An aluminum base of brushed nickel intersects, forming clean right angles to support a thick marble top of polished white. Sure to be a conversation piece this stunning end table option let's you express your creative side. The undulating sides lead up to an eight pointed top in a sassy gold finish. The sides are finished in a blackish/rich brown wood tone with gold highlights. Smartly scaled to fit anywhere in the home. Make a stylish statement with modern adaptability. A burly base of raw nickel iron supports a top of polished white marble, while a subtle industrial-style crank allows for adjustability in height. Handcrafted end table in honed white marble. Handcrafted side table. Inset antiqued mirrored glass top and bottom shelf. Stainless steel frame with "X" shaped sides and back gallery rail. 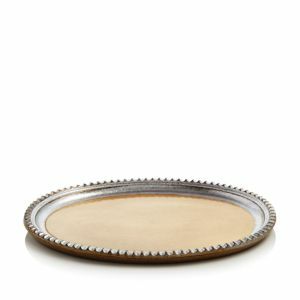 Serve your quests with undeniable contemporary glamour with this exquisite alabaster tray with polished nickel handles. Subtly flared stems, tapering forms and thick bases add distinctive detail to this collection. An assortment of designs for gin-based drinks. Complex traditional techniques transform high quality raw materials into distinctive products for entertaining, dining and decorating. Set includes: serving stand, two cocktail glasses, two highball glasses, two balloon glasses, ice bucket, two double old-fashioned tumblers and four porcelain dishes.